With our Dog birthday party ideas your kids next birthday party will be a success, check out our ideas below. A Dog party is so much fun, and a big favourite for lots of girls. I good idea is to buy stuffed dogs and plan some of the activities around the little dogs, such as making crafts for them, like collars. Make invitations cards using purple or chartreuse card stock paper, fold the paper in two. Take a picture of your dog with a birthday hat on. Glue the picture on the outside of the invitation. Write the party information inside the invitation. This invitation is very easy to do, using brown card stock paper draw a bone onto the paper and cut it out. Write the party information on one side and "IT'S A POOCH PARTY" on the other side. Use brown envelopes. Put 2-3 black paw prints (use a paw print stamp), on the envelope, very cute. We need your wagging happy tails and your silly sloppy kisses to help us bark Happy Birthday to ____ who is turning six! It's a pooch party with goofy games and funny tricks. Please join us the "date" and "time" at "address". Give us a WOOF if not attending to "telephone nr" no later than "date". There is no main colour for a Dog birthday party, unless you are having a particular dog theme such as a Pink Puddle Party. Put lots of colourful balloons with puppies on them all over the party area. Decorate the party area with doggie items - dog stickers, bowls, toys, dog frames, water bottles, etc. For extra glam, you can cut giant dog bones out of construction paper and paint them white and put them all over the party area. Set up a pooch pet place. Use a pop-up tent to create the pet place. Put lots of billows inside the tent and lots of different stuffed dogs, small balls, dog bones, etc. Make index cards for each dog stating each dog's name, fur colour, birth date, personality- such as likes to dig, very shy, good with children, etc. The dogs will be adopted by the guests in the party. If you don't want to make a pooch pet place make individual dog houses using old, large boxes for each pet. The kids can then play with their dogs and their dog houses. Make each dog house different from each other and put the kids name on them. Cut large and small paw prints-shaped hole out of construction paper. Paint it with a paint roller and brown washable paint, and roll dog footprints up your driveway, and down your side path, leading up to the gates of the backyard, in front of your front door, etc. Set the table in advance with a colourful tablecloth with paw prints, (use a paw print stamp). Put lots of dog biscuits and doggie confetti on the table for decoration. Put matching doggie plates, napkins, cups etc. Or put one colour tableware - with dog bowls for each kid. Place a nice doggie (stuffed puppy) on the table for a centrepiece and have the puppy hold onto some balloons - puppy helium balloons. 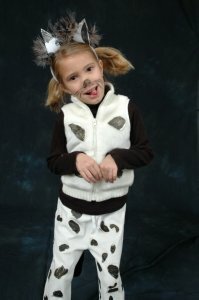 Start the Dog birthday party activates by letting the kids adopt a pooch or transform the little girls into dogs or both. As the kids arrive give each girl a dog make over- The Grooming Station. Using face paint, paint a black nose and whiskers on each girl. You can also paint paw prints on their hands. Use your imagination or learn how to face paint. When done, give each kid their own dog ears (you will get this at most costume store). They will look like little dogs, so cute. Take the girls to the pooch pet place and let each girl adopt her dog. Give each girl their adoption certificate (make this beforehand with your computer- dogs name, date etc), at the day of the party just fill in the owners name. Let each girl make a dog collar for it's dog. The collars are made out of stretchy thread and beads (normal beads and letter beads from craft stores). Tell the kids to put the letters of their dogs name on the collar. Give each kid 3-5 dog shaped cookies (done this by using a cookie cutter), and some icing. Let the kids decorate their dog cookies. Give them the cookies to take home at the end of the party. Look at our cool dog games below, for you kids Dog birthday party. Before the party hide 4 dog biscuits for each child all over the Dog birthday party area. Put each guest name on the dog biscuits. The kids and their dogs have to find the dog biscuit with their name on it. Have a little prize for the doggie who finds his 4 dog biscuit's the fastest. Have an oversized basin, towels, washcloths ready for the kids, so they can bath their dogs, (pretend to bathe their dogs). Doggy, Doggy What Are You Doing? Form a circle, one person has to be the dog. The dogs stands in middle of the circle. The rest of the kids chant "doggy, doggy what are you doing?". The dog answers various things, "eating, taking a drink, scratching my ear, etc", the dog has to do what he says. If he says he is scratching his ears, he has to scratch his ears, etc. But when the dogs answers "I am looking for another dog" he goes after the other kids. The first one tagged becomes the new dog, and the game starts again. Play this game until everyone has been the dog at least once. Hide real dog bones around the Dog birthday party area and let the kids get down on their knees and walk like a dog to find the bones. They have to bring the bones back to their dog bowl (have a dog bowl ready for each kid). They can only bring one bone at a time. This game is really hilarious! Divide the kids into teams. There are 2 different points. The first kids to go has to get down on their knees and while walking like dogs, they have to push a ball with their heads to the first point, leave the ball and pick up a dog biscuit. Holding the biscuit between their teeth, they have to go back to the starting line, walking like dogs. The first team to finish, wins. Provide each child with their own biscuit. Lots of fun, have the kids and their dogs do "dog commands". Dog commands - is a must at any Dog birthday party and it's very cute to watch. This Dog birthday party game is similar to Pin the Tail on the Donkey. Make small tails out of brown paper for each kid. Write their names on the tails, so there will not be confusion over who is the winner. Blindfold the first kid to go and spin her around 2 times before she tries to Pin the Tail on the Puppy poster. The kid who places the tail closest to the correct place wins the game. Lots of fun and the kids love it. Have a dog piñata. Fill the piñata with small dog related items and lots of candy. Finish the Dog birthday party off with a dog story or maybe a Disney dog film. Pick some or all of our yummy food ideas for your Dog Birthday Party. Dog Sandwiches: Make peanut butter sandwiches cut out with a dog bone cookie cutter. Hot Dogs: Kids love them and it goes with the theme. Dog Treats: Put dog treats inside dog bowls such as carrots pretzels, popcorn, chips etc. Dog Brownies & Ice Cream: Brownies cut into the shape of dogs with a cookie cutter and ice cream. Served in dog bowls. Doggie Cupcake: Make chocolate cupcake with a dog-bone lollipop stuck in the middle. Dogg Soda: Lots of soda and water for the kids. Make a big sheet cake, let it cool. Put the cake in the fridge. Take it out after 4-5 hours. Carve the cake to look like a bone. Very easy to do, look at our Bone Cake picture for inspiration. Frost the cake with a yummy frosting and you are done. Serve the cake on dog bowls. To make mini dog cakes, you will need to make or buy 40 cupcakes. You are going to decorate the cupcakes in the shape of paw prints. Frost the cupcakes with white icing. To make the paw prints use the round thin mints for the base of the paw and junior mints for the toes. This cupcakes are yummy and they look really adorable. If you cant find bags with paw prints on them and tissue paper with paw prints make your own goody bags. Get brown paper lunch bags. Using a paw stamp and a bone stamp, stamp brown paws and red bones on the bags. Fill the goody bags with a doggie necklace, dog stickers, dog bone candy, a dog colouring book and a pack of crayons. For favors, also include the doggie collar and the dog cookies the kids made. If you want to give your little guests something special as a favor, give them a small dog print pillowcase. It's really nice and a great gift. At the start of the party, when all the guests are done with their face painting and have all adopted a dog. Take a group picture of all the girls holding their adopted dogs, with their face painted like dogs. Use this picture as a thank you card. Write something at the back of the picture, such as "Thank You for Coming to My Dog Birthday Party". Your kids friends will love the picture! I hope our ideas will help you plan a wonderful Dog Birthday Party for your little princess. And I hope she will love her party. Also, please don't forget to SHARE your- Dog birthday party pictures! We would love to receive pictures of the cake and other fun pictures.